I’ve mentioned before that in the surrounding desert there are all sorts of animals that roam free, cows, horses, donkeys, goats, even the occasional deer and all make trails. The best trails are the ones cows make. Cattle have a tendency to use the same trails over and over again in search of food and cowhide is wonderful stuff when it comes to the inconvenience of cacti and other sharp and pointy plants. Add to that mix a couple of serial trail builders and you have a desert wilderness absolutely full of trails that go off in every direction, not to mention go for miles. The serial trail builders are a Father and son team of campers on our beach who delight in following the cow trails, widening them and cutting away all the nasty stuff that make it hard for humans to utilize them. They’ve been at this for a very long time and even using a GPS, I’m sure that it would be very hard to map them all. A week or so ago, I was talking with one of the campers who was telling me about going for a walk with her granddaughter. They had walked down the beach to The Palms and then wandered through the Graveyard. “What graveyard?” I asked. 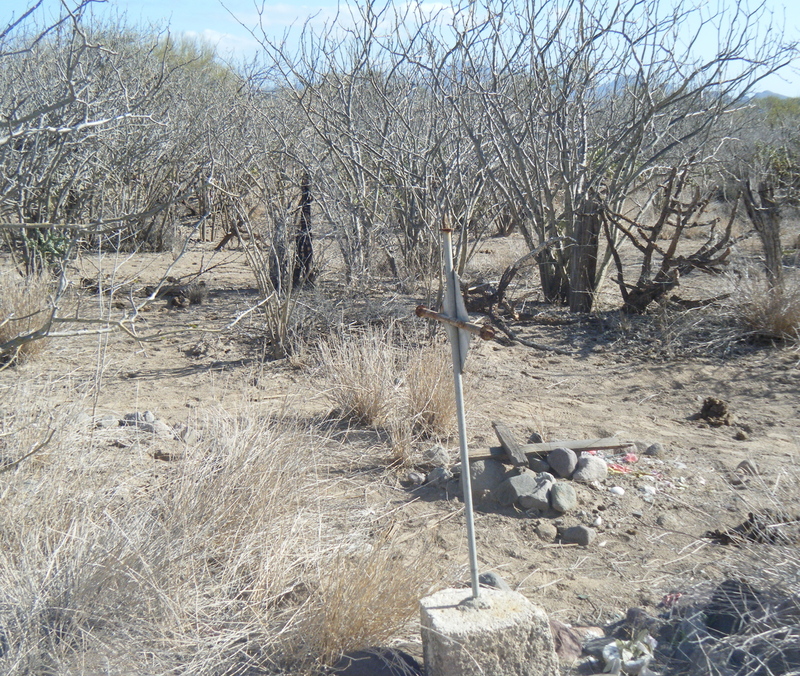 “Well, there’s an old graveyard in behind the old Rancho ruins.” She answered. “How do I find it?” I queried. “Just follow the trail and look for the rock cairn.” She replied. That sounded easy enough so I decided that I would give it a go in the next week or two. A small grave, possibly a baby. I should explain that there are not a lot of naturally growing palms here. The few that do exist are clustered around watercourses or arroyos and The Palms is one of those places. The trees are on the shore and it’s a popular walk. Not to mention that it’s a pretty easy place to describe and find since it’s one of the few places where palms grow on the beach. The day was sunny and warm and the tide was low, so off I went, down the beach to The Palms. Once there, I turned and headed up the road which accesses the beach from the highway, looking for the ruins and the trails. The ruins were easy to find and I wandered over to them looking for the trail, which I found almost immediately and started to follow. This is when it became apparent that there was more than one trail, way more than one. There were trails going in every direction and all of them were marked with rocks, sticks and Cairns. I eventually ended up back on the road, so I headed back to the ruins figuring that there must be more than one trailhead. I thought I’d try another trail and keep at it for while. If I didn’t find the graveyard, I’d go back to Rattlesnake Beach and get better directions from the Master Trail builder himself. Just a couple of the 24 graves. Providence smiled on me when I stumbled on the campsite of a friend who’s been camping in the area for the last couple of months. When I asked him if he knew the way to the gravesite he said not only did he know the way but also if I liked, he would guide me there. Well, my Momma didn’t raise no stupid kid, I took him up on the offer immediately and away we went. Of course it was only a few feet away from a trail that I’d already been on, but such is the story of my life! Not only did he guide me there, but he also had quite a bit of information about the history of the place. There are 24 graves in the graveyard, more than half of them are children and only one still has a legible marker. 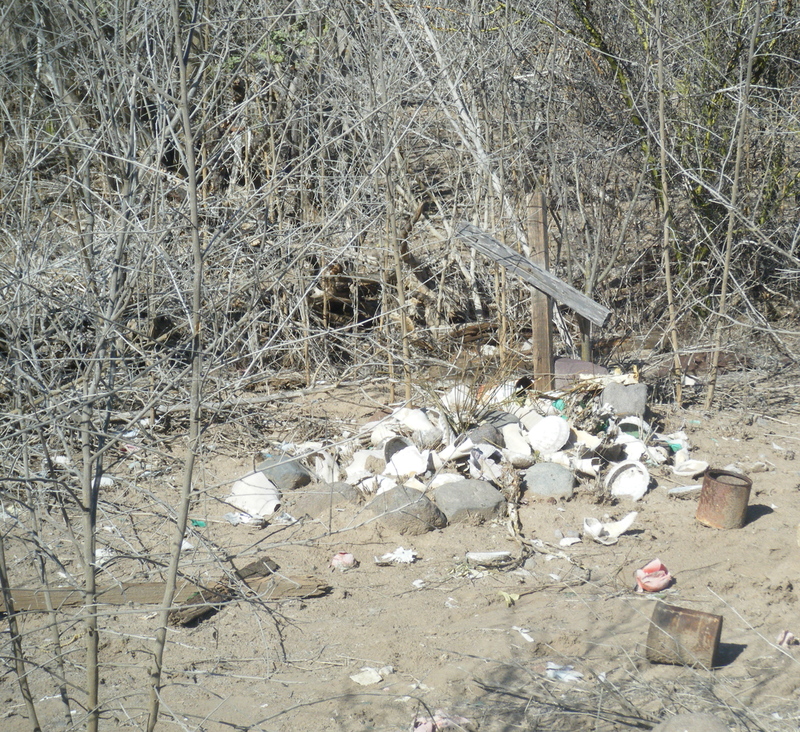 Apparently this whole area was part of Rancho Romero, including the ruins and a well that still has potable water in it. Due to the fact that potable water was hard to find, the original settlers found that agriculture was a difficult proposition at best. So as far as the Spanish government was concerned the land was virtually useless. This meant that land was cheap and Ranches or Rancheros were huge in acreage. As far as I’ve been able to figure out, between Loreto and Ligui, (about 40 kilometers distance) on the shore side of the Gigantes, there were only 3 Rancheros. Rancho Notri is still in existence and still has all of its original acreage. Rancho Romero still exists but is a shadow of its historic size. The third, Rancho Tripui has been broken up and no longer exists at all, except for the name as applied to an RV park and hotel. As you can see from the photos, this little graveyard has fallen on hard times. The only legible marker has the date 1917 engraved on it and it is probably the last and most recent burial. This marker was reset in cement in 1987, and that was probably pretty close to the last time any attention was paid to the site. The wooden crosses have disintegrated and some vandalism has occurred though not recently from the looks of it. 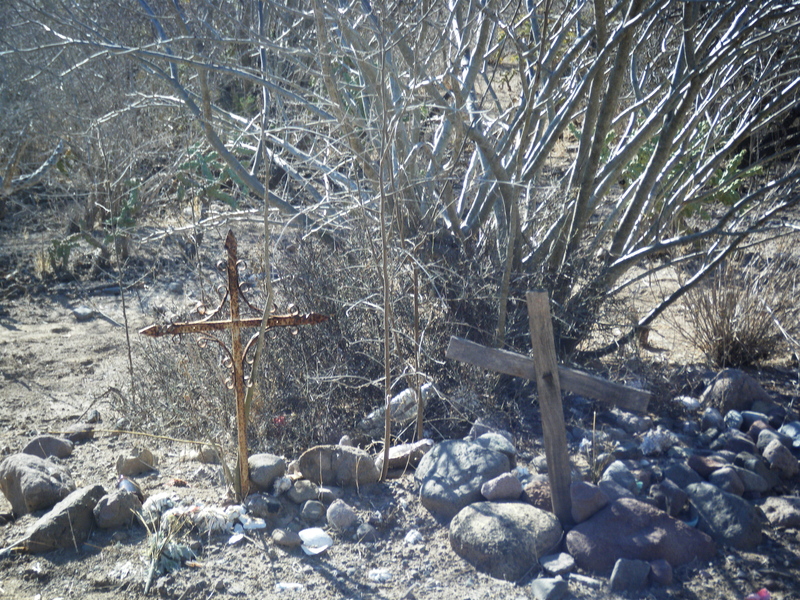 You’ll notice that the graves are marked with the material that was available, stones, shells and glass bottles. This material was the only stuff available to the families that had a possibility of survival in this harsh climate. At home we plant grass and flowers to mark gravesites along with metal or granite markers, here the grass and flowers wouldn’t survive without constant watering and no one was going to waste potable water on plants when it was needed for people and animals. A granite marker was also out of the question since these people were very poor and only the wealthy could afford to mark their gravesites with a material that had permanence. 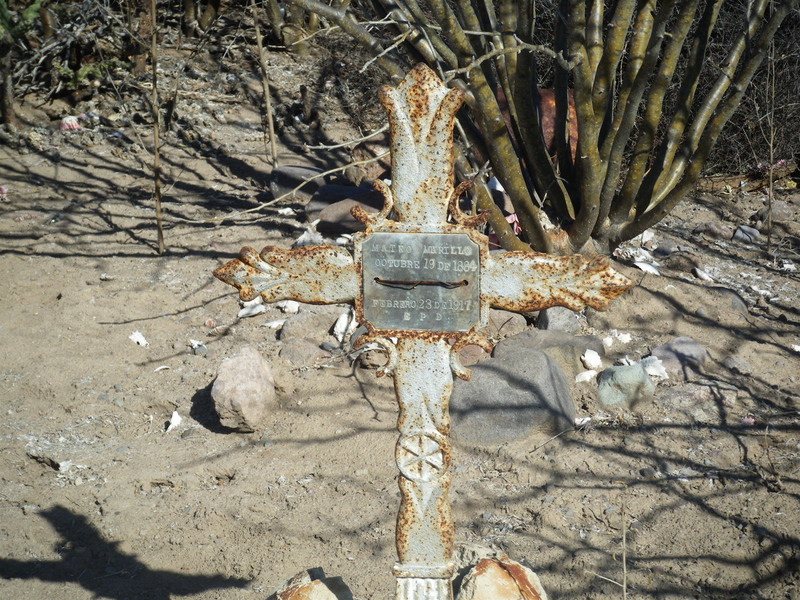 As I wrote in my blog about the roadside shrines, members of the family look after shrines and graves. They are cared for and tended lovingly as long as there are survivors to do so. New floral wreaths are placed annually on the Day of the Dead and the graves and shrines are kept clean and tidy. Once there are no more family members alive or at least ones who care, these memorials fall on hard times and gradually disintegrate. In the case of this graveyard I believe both are the case. I’m not sure I can describe the feeling of standing in this little place, a place that has been forgotten and ignored, yet represents a tiny slice of the past of Loreto and area. Since I’m an avid history buff, I enjoy being able to explore places like this and as long as individuals like myself continue to do so, these people and their history will never be completely forgotten. So as I headed back to Rattlesnake Beach on yet another trail, I marveled at the prolificacy of our serial trail builder. Without him and his years of work, a part of the history of this area would have been lost and folks like me would have had to be happy with walking the beach or the highway. Instead we get to enjoy so many trails that we can virtually walk a new one everyday. Not only that, but sometimes we learn things too. Not bad for a simple day of walking the trails, eh?